Beautiful custom home in Bear Creek Estates on 2.1 acres with a plethora of mature trees. This home features a charming wrap around deck to relax and see the beautiful blue skies. Lots of natural light with high ceilings throughout. 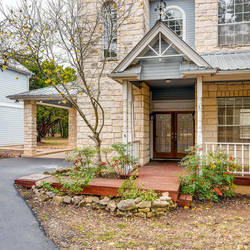 you are sure to enjoy the beauty of country living while still being so close to the city. In addition, enjoy the studio apartment with full kitchen above the detached garage out back! For more information, contact Ashley Markham at 619-675-1848 or email us at Listings@PapasanProperties.com.